Knoll Studio is an unparalleled resource for furniture for the workplace and the home with an unwavering belief in the power and utility of modern design. Offering timeless, enduring designs for lounge and reception areas, workplace environments, dining facilities, healthcare organizations and educational institutions, we turn spaces of high visibility into laces of comfort and distinction. In 1929, Ludwig Mies van der Rohe was commissioned to design the Barcelona Pavilion at the World Exposition. Realized the building needed furniture, so he designed the Barcelona Collection. These were intended to be 'one time only' pieces. he never imagined they would become trademarks of 20thCentury Design. Florence convinced Mies to let Knoll produce the Barcelona Collection. They worked very closely on production. They changed the frame from plated to steel to stainless and all the joints are hand welded and rubbed to eliminate any seams. Ludwig Mies van der Rohe began his career working in his father's stone masonry business. After an apprenticeship with furniture designer Bruno Paul in Berlin, he joined the office of architect Peter Behrens, whose work presaged the modern movement. In 1912, Mies established his own office in Berlin, and later became a member of the Deutscher Werkbund and Director of the Bauhaus. He immigrated to the United States in 1938, setting up a practice in Chicago. His buildings include the German Pavilion for the 1929 Barcelona Exposition, the Tugendhat Villa in Brno, Czechoslovakia, the Seagram Building, designed with Philip Johnson, a cluster of residential towers along Chicago's Lakeshore Drive in Chicago, and the Illinois Institute of Technology campus, where he was the director of architecture. 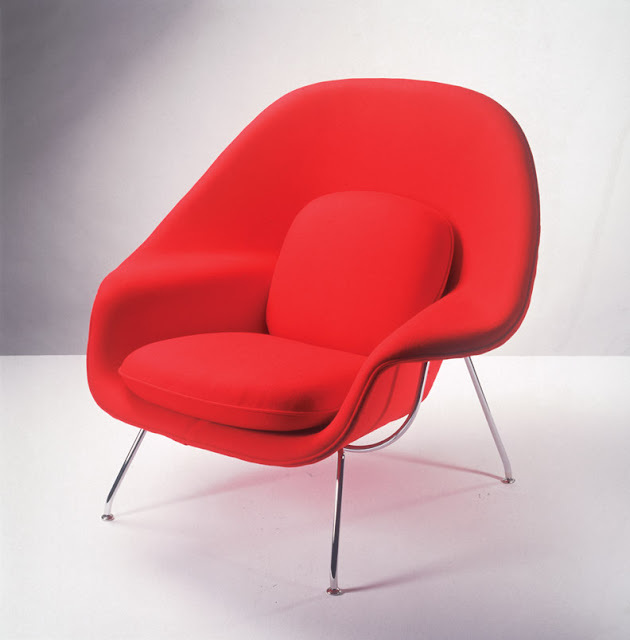 In 1948, Florence collaborated with Eero Saarinen and came up with a large, comfortable lounge chair: The Womb. They used new materials: molded fiberglass covered with textile. Knoll is still using the same mold to produce this line. Florence Schust was virtually adopted by the Saarinen family. Florence went to the Cranbrook School of Design and became friends with Eero Saarinen, Charles Eames and Harry Bertoia. Because of these friendships, she was able to get these designers to work with Knoll. Florence believed that a good design must also have a function. Eero Saarinen was like a brother to Florence Knoll. The son of architect and Cranbrook Academy of Art director Eliel Saarinen and his wife, Textile artist Loja, Eero Saarinen studied sculpture in Paris and architecture at Yale before working on furniture design with Norman Bel Geddes and practicing architecture with his father. He collaborated on several projects in furniture design with his friend, Cranbrook alumnus Charles Eames, and opened his own practice in Bloomfield hills in 1950. Among the many buildings for which is he known are the Dulles International Airport in Washington DC, The Gateway Arch in St. Louis, Missouri, and the TWA Terminal at Kennedy International Airport in New York. He was the recipient of numerous awards and the subject of many exhibitions. 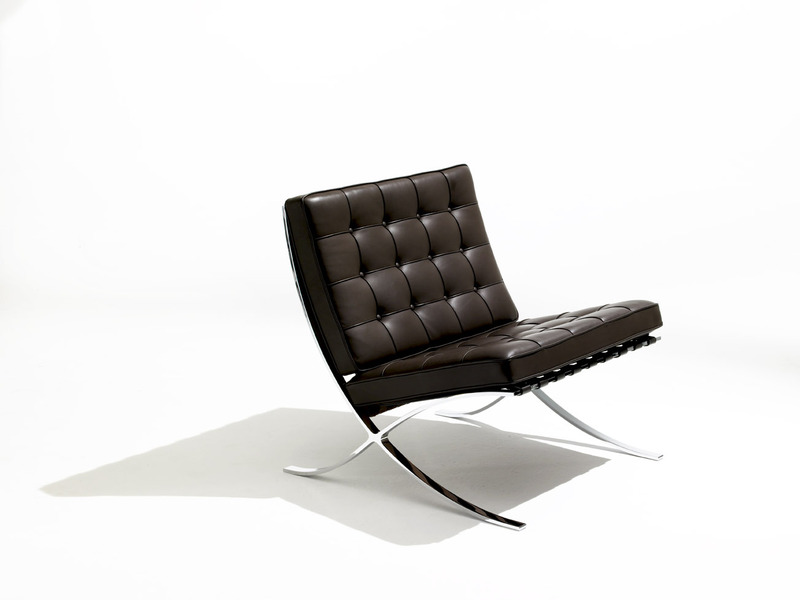 In the 1930s, Hans Knoll partnered with another designer, Jens Risom to create the first chair for Knoll Inc., Risom side chair and lounge chair. Unfortunately, materials were hard to come by because of the War. So they decided to use semi-hard wood and rejected parachute webbing to design an affordable, accessible chair. These materials were more available to Hans and Jens. Jens Risom, received his education in Denmark at the Krebs' School, St. Anne Vester School, University of Copenhagen and Copenhagen's Kunstandvaerkerskolen. 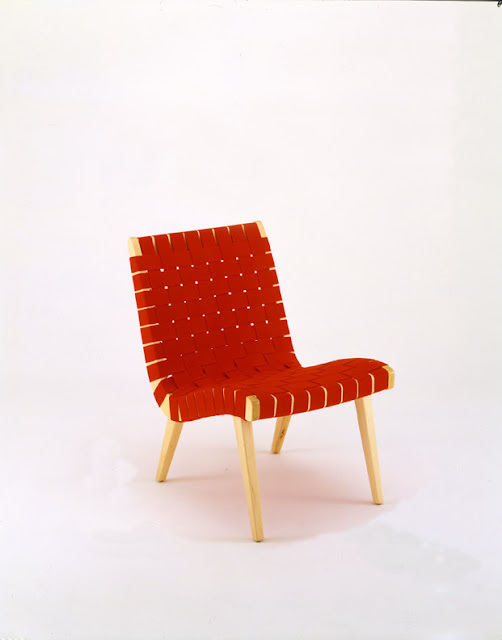 He worked as a designer of furniture and interiors in the Copenhagen office of architect Ernst Kuhn. After moving to the United States, he became the design director of Dan Cooper in New York and also designed for Georg Jensen. Responsible for designs dating to the mid-20th century, Risom is a trustee of the Rhode Island School of Design and was knighted by Queen Margrethe of Denmark in 1966. RJE has these and serval classic pieces on their showroom floor, so stop by and take a seat with the classic.